Location: Mt Blanc Massif - start and finish point is Chamonix. Duration: 6 nights, 7 days. Five days of walking. Trip possible from July to August. Two nights in comfortable hotel accommodation, four nights in hill refuges. Fly to and from Geneva airport (not included) - lots of budget airline flights. Experience - previous experience of hill walking with a good level of fitness. We normally run this trip over a week, Sunday to Saturday, however if you would like to do this at any other time then please contact us. Sunday Arrive Geneva, transfer to Chamonix to your Hotel. Meet with guide and check kit and route. Monday Lavachey to La Fouly (6 hours). Transfer from Chamonix to Lavachey, via the Mt Blanc tunnel into Italy. Set off from Lavachey heading up towards the Grand Col Ferret at 2537m that lies on the border of Italy and Switzerland. Once you have reached the Col, there are great views along the length of the Ferret and Veni valleys. Val Ferret is one of the most idyllic Swiss valleys and walkers will be rewarded with views of flower meadows and chocolate box chalets as they descend from the Col and head to La Fouly for the night. Tuesday La Fouly to Champex (4.5 hours). From La Fouly (1610m) head for Champex (1466m). This is the easiest stage of the full TMB, so a nice stage for your second day! The path wanders from La Fouly to Champex through pleasant pine forests. You pass through the village of Praz de Fort and continue to Issert. The trail then branches off the main valley and climbs gradually around the hillside, traversing above the pretty village of Champex with its deep blue lake, where we stay for the night. Wednesday	Champex to Col de la Forclaz (6.5 hours). The walk today is the toughest of the whole route and takes in the Fenetre d'Arpette, the highest point reached on the TMB at 2665m, offering mountain pass walking with fantastic views of the upper Trient glacier. The glacier is viewed for most of the descent, and the path levels out as you reach the Col de la Forclaz - a welcome relief after the strains of the earlier climb. Accommodation at Hotel du Col de la Forclaz. Thursday Col de la Forclaz to Tre-le-Champ (5.5 hours). Today marks the crossing of the Swiss / Franch border at Col de Balme, at which point Mt Blanc comes into view for the first time since leaving Chamonix. 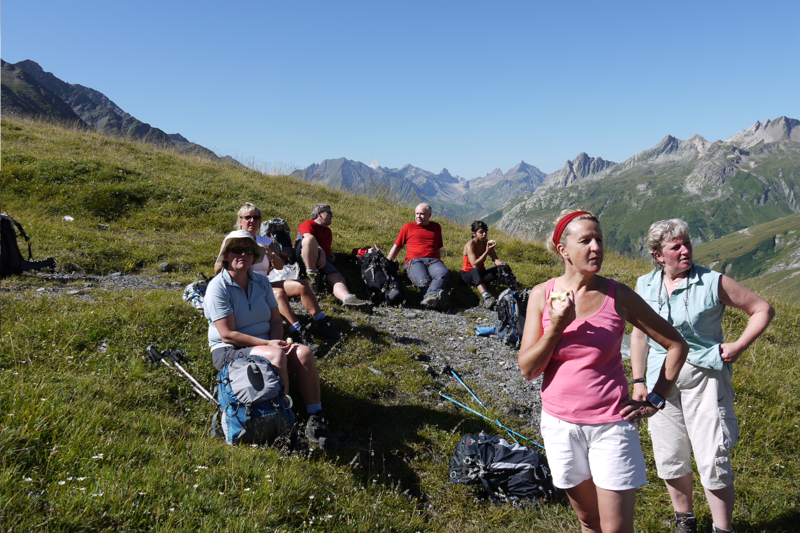 The walk continues along the Aiguillettes des Posettes (2201m), an elevated path providing a panoramic view. Accommodation is provided at Tre-le-Champ or Les Frasserands. Friday Tre-le-Champ to La Flegere (4 hours). Two routes may be taken to reach the Tete aux Vents (2132); the first involves the Passage delicat, a steep climb up a crag using metal ladders and handrails. 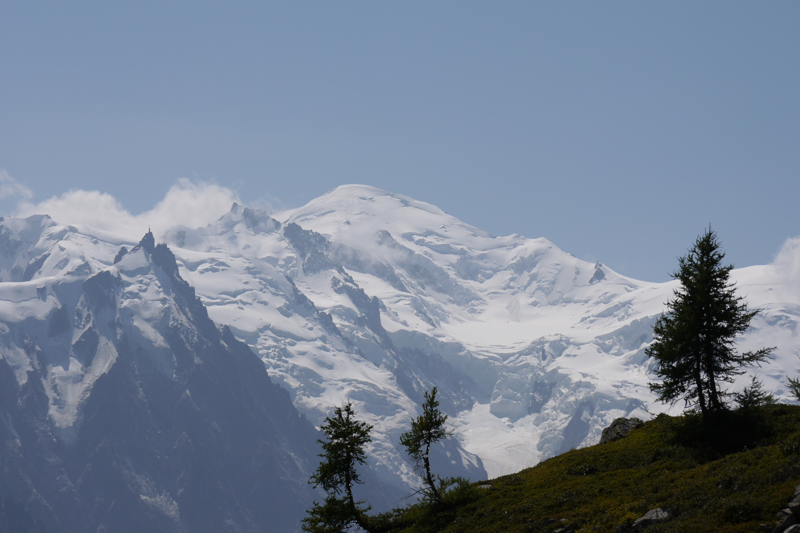 For those inclined towards vertigo, a more enjoyable option is to walk up the road above Tre-le-Champ, then head onto the Pedestre du Pays du Mt Blanc. 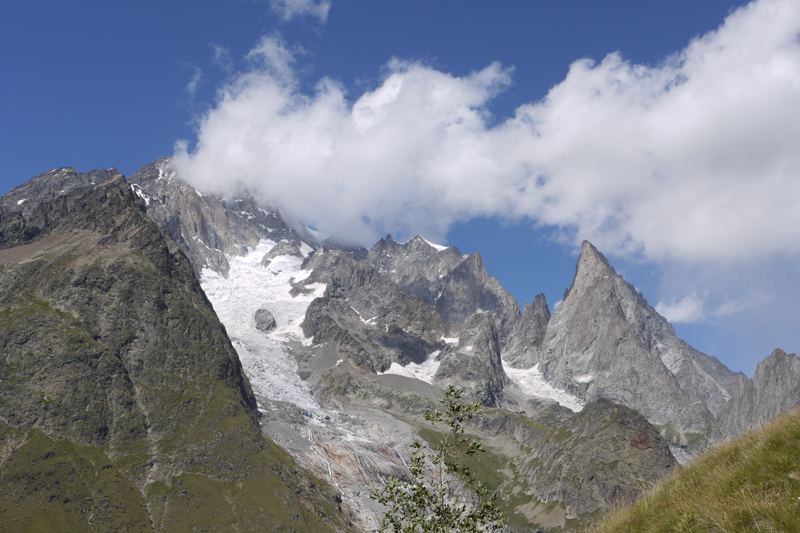 At the Tete aux Vents, the north flank of the Mt Blanc range spreads out before you - a worthy reward for the climb. The route then continues on to the Refuge La Flegere (1875m). Before descending to Chamonix, there is the opportunity to walk (1.5 hours) or catch the telecabine to l'index, where you can stroll up to beautiful Lac Blanc that provides one of the most beautiful views of Mt. Blanc in its reflected image. You may walk or catch the gondola back down to Chamonix, and then enjoy your last night in the valley. Saturday After a relaxing breakfast transfer from Chamonix to Geneva airport for journey home. Please note: This itinerary is a guide only. It can be subject to change dependent upon viability, course members' fitness, weather conditions or for any other reason the guide may deem necessary. Professional organisation of the event. Briefings on the routes and equipment checks to make sure that you have everything you need. Two nights' twin hotel accommodation with breakfast. Single rooms are available for a supplement. Four nights' half board dorm room accommodation in Mountain Refuges. All road transfers relevant to the course. Group first aid with qualified first aiders. Bookings can be made for groups of 10 participants upwards for a guided tour. Self Guided bookings can be taken for 1 participant upwards. A single room supplement may apply at some accommodation for solo travellers. Choose your preferred dates from the calendar and click Book Now.